Now you are little familiar with photoshop interface.Today we are going to know about Tools Panel in photoshop.I think you are little bit confused when you first took eye on Tools Panel.Don’t be confused this post will explain you the use of each and every tool in photoshop. First look at below image and be familiar about each tool and their shortcuts. The above image shows the full list of tools in photoshop.So now we are going to explain use of each tool from top to bottom order. The Move Tool is used to move selections, objects, and layers. The Marquee Tools are used for selecting objects such as rectangles, squares, and ellipses. The Lasso Tool is used for making freehand selections. Not a very precise tool and I almost never use it but beginners may find it attractive. The Polygonal Lasso tool is a bit more precise, allowing you to create a selections formed by straight lines. It has limited uses for selecting rectangular objects- like benches or fences. If you are using the Lasso Tool you can temporarily access the Polygonal Lasso Tool by holding Alt. The Magnetic Lasso Tool has the most precision of all the tools in the group. It works by snapping to the edges of the objects. You simply click once on the edge of the object you want to select and release the mouse button. Then carefully drag around the object and notice how the Magnetic Lasso Tool “snaps” to the edges. Quick Selection Tool has the advantage of being, as the name suggests, quick. Its icon looks like a brush and if you start painting with this brush inside of an object you will quickly select it. It helps a lot if the object has strong edges but even if it has soft edges (like a face against a reddish sky) it still behaves pretty well. Highly recommended for quick work or if you don’t know how to use other tools. Not recommended for precise selections. The Magic Wand Tool is a nice little tool that has its uses from time to time. If you click somewhere in the image it will select all pixels in that area that have a luminosity level close to the luminosity level of the level you clicked. You can set this by entering a value in the Tolerance box (the Tolerance is situated in the tool option bar along the top of the screen). The Crop Tool allows you to crop your images to the desired size. Click, drag, press Enter and you just cropped your image. The cropping is best done at the end of the editing process. The Prespective Crop Tool (New Crop Tool From Version CS6):There are several reasons why images are captured at an angle, in this case, it is to avoid the reflection from the flash that may occur if the painting has a glass frame. To obtain the image as if it were a flat image, Photoshop CS6′s Perspective Crop Tool does an excellent job. The Slice Tool and Slice Select Tool are mainly for Web Designers and have very few uses for regular uses. How it works? Well, you drag with the Slice Tool and create rectangles (usually web pages layouts). After you’re done you select Save for Web & Devices from the File menu and select a folder. This process will save each sliced portion as a separate image thus allowing you to quickly use these images for website creation. If you’re doing color correction in an image then the Eyedropper Tool is your best friend. To use it properly first set the Sample Size in the option bar (the option bar I keep talking about is situated just below the Menus) to 3×3 or even better 5×5. Hover the Eyedropper tool over the image and notice how the R G B values change. If you click with this tool anywhere on the image you will set the Foreground color to the color below the Eyedropper Cursor. A quick way to access the Eyedropper tool while having the Brush Tool selected it is to press the Alt key. Hold Shift and left click while using the Eyedropper tool to access the Color Sampler Tool and create a new color sampler (you can have a maximum of 4 color samplers). This information is very useful when you do color correction or you want to know what are the values of a specific area. Even better, you can change the Mode to Lab, CMYK, HSB or other wacky modes. I remember that I used this tool a lot when I was first learning about Photoshop to see how various adjustments and blend modes affect the pixels values. The Ruler Tool is for measuring the actual dimensions on the screen. Not a lot of uses for this tool (maybe if you’re a web designer) but it has one nice feature.It is used to straigten images. I never use the Note Tool but you may find it helpful if you’re passing documents to other people and you want to indicate something. This tool is used to add certain notes that each could indicate a specific problem you want someone to address or maybe if you’re extremely forgetful write notes to yourself, like “Don’t forget to reduce the saturation here” or “Remove this ugly spot here”. Finally, the 123 Count tool is for counting objects. 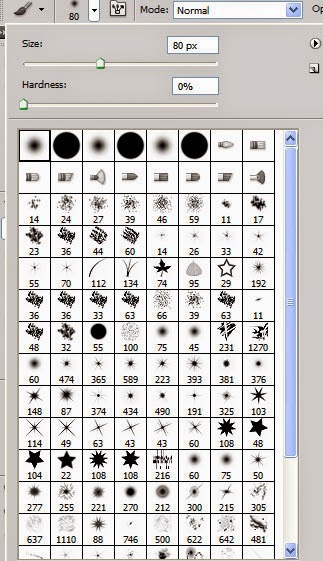 It probably has its uses for certain people but I haven’t ever felt the need to count objects in an image with a tool. These tools are very important if you are doing a lot of facial retouching. 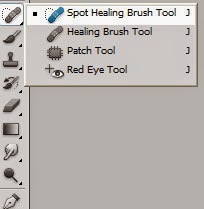 The Spot Healing Brush Tool is the easiest to use. You simply find the skin imperfection you want to remove and click on it. It’s not the most advanced technique for making clean skin but it is a basic and very fast tool. The Healing Brush Tool is the same as the Spot Healing Brush Tool with the difference that it requires you to set a sample point so that Photoshop will base its healing algorithm on the area of the picture set as the sample point. To put it more simply: you will heal all your next spots based on the area you Alt-clicked on. The Patch Tool is a different beast from the first two and it’s very useful for seamless blending of skin or other uniform surfaces. Finally, the Red Eye Tool requires you to select an iris with a red eye problem and it attempts to remove the redness in the pupil. Although there are more advanced ways to do that (with Curves or Channels) this tool does a pretty good job. The Brush tool is probably the most used tool in the Toolbar panel. You can use it to paint with pixels over your image. The round brush tool is the one selected by default when you first open Photoshop so you probably have played with it a little. This brush has two important settings you will want to play with: size and hardness. Hardness represents how defined the edges of the brush are (or how blurry). Set the hardness setting to maximum (100%) and you will paint with ugly hard strokes. In the brush option panel (usually you can find the option panel in the upper area, just below the menu bar) you can also change the blending mode of the brush. Combined with the layer’s blending mode this option offers you some wildly creative options. A useful keyboard shortcut for the brush tool are the bracket keys ([ / ]). Clicking the left bracket key decreases the size of the brush while the right bracket key increases the size. Holding Shift while pressing the bracket keys allows you to increase/decrease the hardness of the brush. The round brush tool is not the only tool available: Photoshop offers you a wide range of different shaped brush for your needs. The Pencil Tool is basically a downgraded version of the Brush tool. You don’t have a hardness option (in fact you do have a hardness slider but dragging it doesn’t change a thing) but you have almost all of the features of the Brush Tool. You will probably be interested in the Pencil Tool if you do pixel art. The Color Replacement Tool allows you to replace one color with another. It has a bunch of settings in the Options panel and it offers some interesting results but to be honest I almost never use it. There are better, more accurate ways to replace some colors with other colors (at least for me) so I won’t go into detail about how to use it. The Mixer Brush Tool is Photoshop’s attempt to mimic traditional painting behavior. Again, I don’t use this tool at all but if you’re into traditional painting and you want some digital tools to play with I recommend Corel’s Painter which is built solely for this purpose.